Mini implant dentures treatments are one of the most popular choices by our patients to restore their smiles and with a reason! They are some of the most affordable alternatives for full mouth restoration. Our Snap in Dentures are strong and have great primary stability. The latest advancement in technology has allowed mini implants to become a real solution for people with little bone volume and have no teeth left. Mini implants can be used on people of many ages as long as they are healthy. Among the advantages we find in this technique is that this is a much simpler treatment than if we compare it with the regular dental implant technique, in addition it has a greater speed of recovery. Comfort is also an important factor, as they are easier to clean. 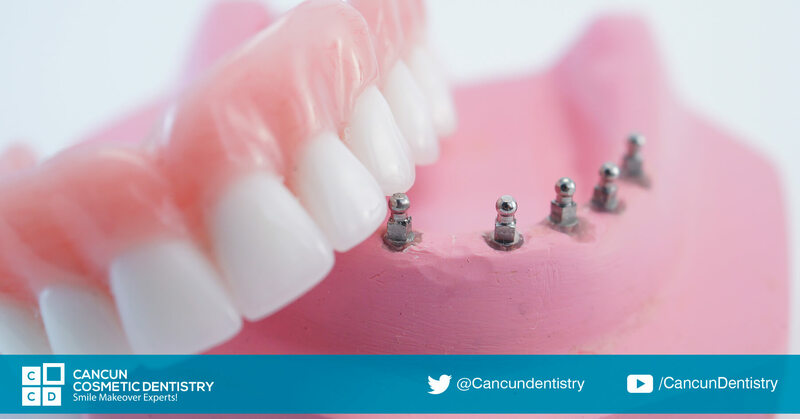 These mini screws have a round tip (or ball) that is the retention system that holds the snap in dentures fixed, giving the patient the possibility of removing it when necessary to maintain a good hygiene by brushing and washing the prosthesis. The usual placement of a regular implant requires a free-loading period of 3 to 6 months to complete the osseointegration process, but today we know that osseointegration protocols with immediate loading do not alter the healing process when this solution is used in indicated patients and respecting some rules. Our doctors will do an evaluation to see if you are candidate for this treatment or you have other option. In this way we can resort to the immediate load when the patient has a good health and adequate oral hygiene. Cleaning the heads of the mini implants is very important! What to do on a dental emergency? – Cancun Cosmetic Dentistry Reviews from our Canadian and American happy patients!